Simplify minicircle production with this kit that provides an easy and efficient way to produce high-quality minicircle DNA. The MC-Easy™ Minicircle DNA Production Kit enables simple, reproducible, and efficient production of high-quality Minicircle DNA. The finely tuned growth and induction media is optimized for minicircle production, and the included ATP-dependent DNase reagent selectively removes genomic DNA without affecting the quality of the minicircle DNA, for clean and effective minicircle production prep after prep. Choose from this kit, which comes without the ZYCY10P3S2T E.coli Minicircle Production Competent Cells (Cat.# MN910A-1/MN915A-1), or the kit that includes competent cells (Cat.# MN920A-1/MN925A-1). For-profit organizations, please see the Product Note at the end of this section. Our MC-Easy Kits also come with a special minicircle DNA transfection reagent, MC-Fection™, that works well with most cell lines. When you want sustained transgene expression without introducing any foreign DNA—such as for model animal and gene therapy development—Minicircle Technology is a great gene expression option. Produced as small excised, circular DNA fragments from a parental plasmid, the non-viral, episomal Minicircle expression cassette is free of any bacterial plasmid DNA sequences, and comes with a variety of promoter and reporter combinations. Their small size facilitates more efficient transfection than what’s possible with standard-sized plasmids, and, while Minicircles do not replicate with the host cell, expression lasts for 14 days or longer in dividing cells, and can continue for months in non-dividing cells. Parental minicircle plasmids and the ZYCY10P3S2T Producer Bacterial Strain are available for purchase by not-for-profit researchers only. Commercial users may purchase pre-made, ready-to-transfect minicircle DNA only. SBI also offers custom parental plasmid cloning and minicircle DNA production to both not-for-profit and commercial end users—contact services@systembio.com for additional details. For any other purposes, including the ability to buy the parental MC production system, commercial users should contact SBI at tech@systembio.com for further information. Inoculate 2 mL of LB/Kan with ZYCY10P3S2T Minicircle Production Cells that have already been transformed with the parental minicircle plasmid, and grow for 1 hour at 30°C. Use the 2 mL culture to inoculate 200 mL of LB/Kan and shake for 16 hours (or overnight) at 30°C. Add 200 mL Induction Medium (included in the MC-Easy Kit), and shake for 5.5 hours at 30°C. Transfer culture to centrifuge bottle and spin at 1,500g for 15 minutes. Decant media and either continue-on with the minicircle maxiprep, or freeze pellet. To generate minicircles that are ready for transfection, you need your Minicircle Cloning Vector with your insert (gene, promoter-gene cassette, small RNA, etc. ), SBI’s optimized, ready-to-transform ZYCY10P3S2T E. coli Minicircle Producer Strain (Cat.# MN900A-1), and arabinose (Cat.# MN850A-1). Minicircles are produced from the full-sized Parental Minicircle using PhiC31 Integrase, which mediates a recombination event between the PhiC321 attB and attP sites on the parental plasmid (Figure 1). 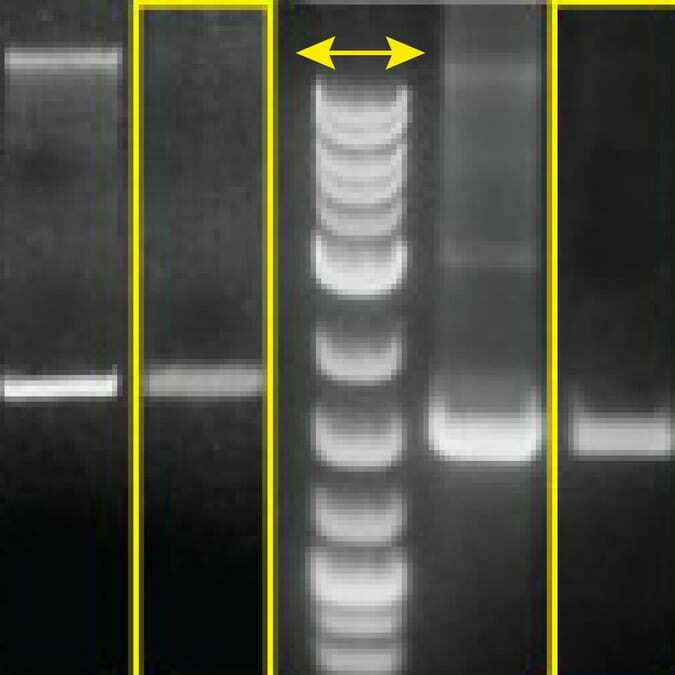 This reaction results in two products—the minicircle, which is now free from any bacterial DNA sequences—and the parental plasmid. To get rid of the parental plasmid, the I-SceI endonuclease recognizes and acts on the I-SceI sites on the parental plasmid, resulting in degradation of the parental plasmid. Figure 1. Generating minicircle DNA from the Parental Minicircle Plasmid. The Minicircle Producer Strain harbors an arabinose-inducible system to express the PhiC31 integrase and the I-SceI endonuclease simultaneously. The ZYCY10P3S2T strain also contains a robust arabinose transporter LacY A177C gene. Adding arabinose to the media turns on expression of the PhiC31 integrase and endonuclease genes, resulting in separation of the Parental Minicircle Plasmid into the individual minicircle and parental plasmids (from the PhiC31 Integrase activity), and the degradation of the parental plasmid (from I-SceI endonuclease activity). Figure 1. Easy and clean minicircle production with the MC-Easy Minicircle DNA Production Kit. Note the genomic and parental DNA bands that only appear in the minicircle preps that did not use the MC-Easy Kit. Figure 2. Easy, sustained transfection in most cell types. Transfection of 1 μg of minicircle DNA (pMC.CMV-MCS-EF1-GFPSV40PolyA, Cat.# MN511A-1) into HEK293 cells delivers over one week of robust gene expression. Figure 3. Express transgenes for weeks in animal models. (A) Hydrodynamic tail vein injection of 2 µg and 4 µg of minicircle DNA (CMV-GFP-Luc) into mice shows excellent expression after 48 hours. (B) Minicircle-delivered transgenes retain robust expression that can last for weeks compared to transgenes that are delivered using plasmid DNA, where expression is rapidly lost. In this study, 40 µg of minicircle DNA was introduced into mice via hydrodynamic tail vein injection.